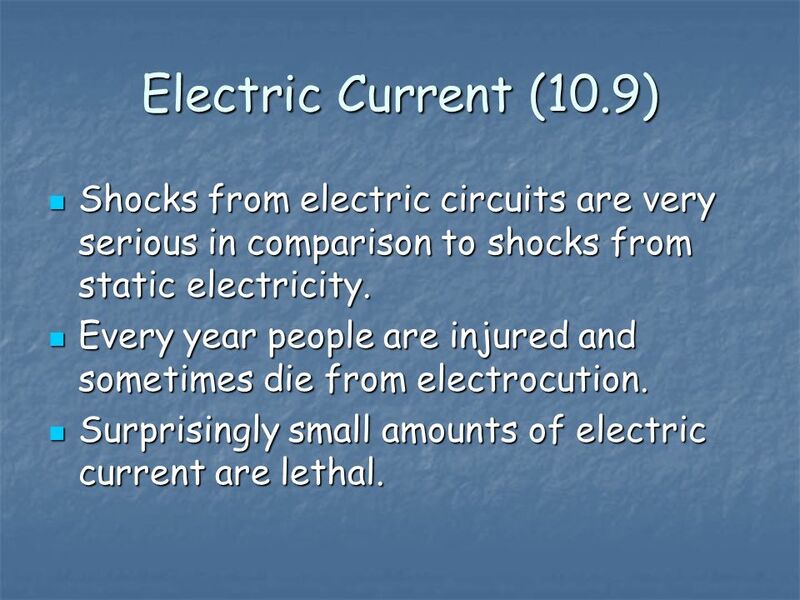 2 Electric Current (10.9) Shocks from electric circuits are very serious in comparison to shocks from static electricity. Every year people are injured and sometimes die from electrocution. 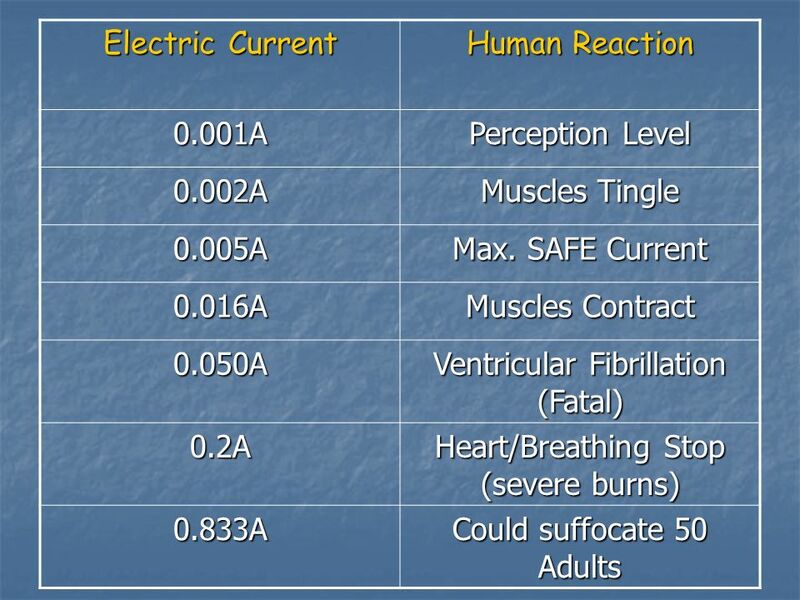 Surprisingly small amounts of electric current are lethal. 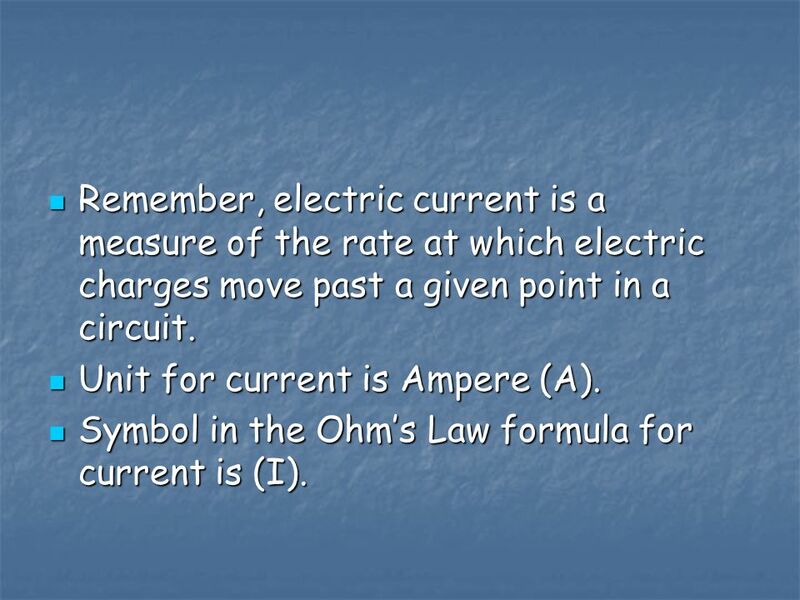 3 Remember, electric current is a measure of the rate at which electric charges move past a given point in a circuit. Unit for current is Ampere (A). Symbol in the Ohm’s Law formula for current is (I). 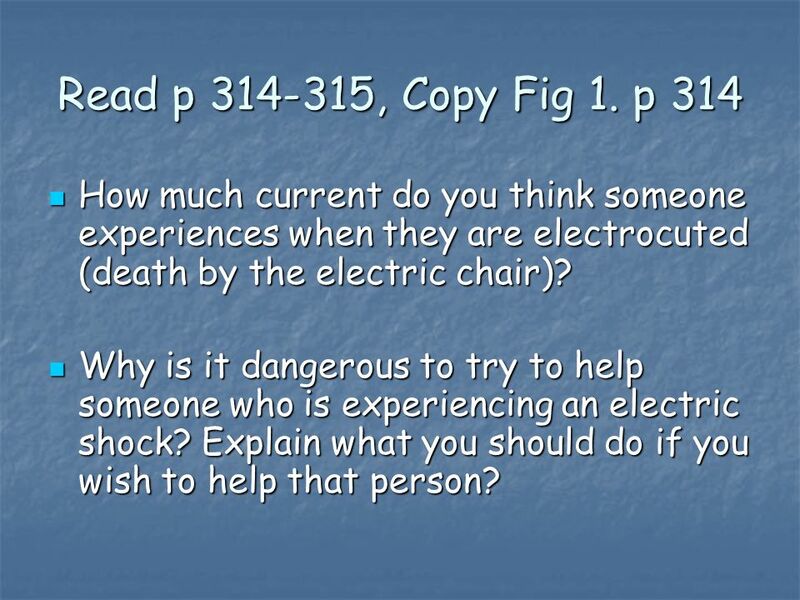 5 Read p , Copy Fig 1. p 314 How much current do you think someone experiences when they are electrocuted (death by the electric chair)? Why is it dangerous to try to help someone who is experiencing an electric shock? Explain what you should do if you wish to help that person? 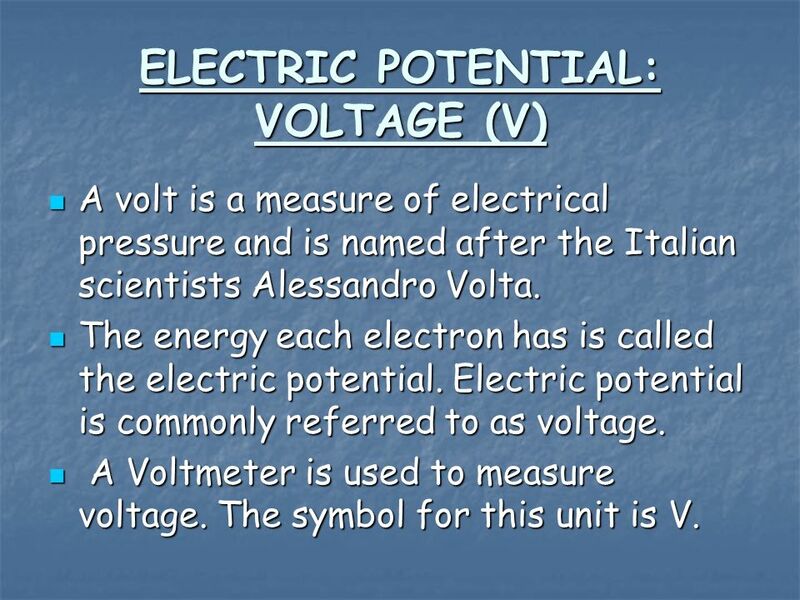 A volt is a measure of electrical pressure and is named after the Italian scientists Alessandro Volta. The energy each electron has is called the electric potential. Electric potential is commonly referred to as voltage. A Voltmeter is used to measure voltage. The symbol for this unit is V.
7 CURRENT (I) Electric current is the quantity of electricity going by a point in a circuit. Current (I) is measured with an ammeter. 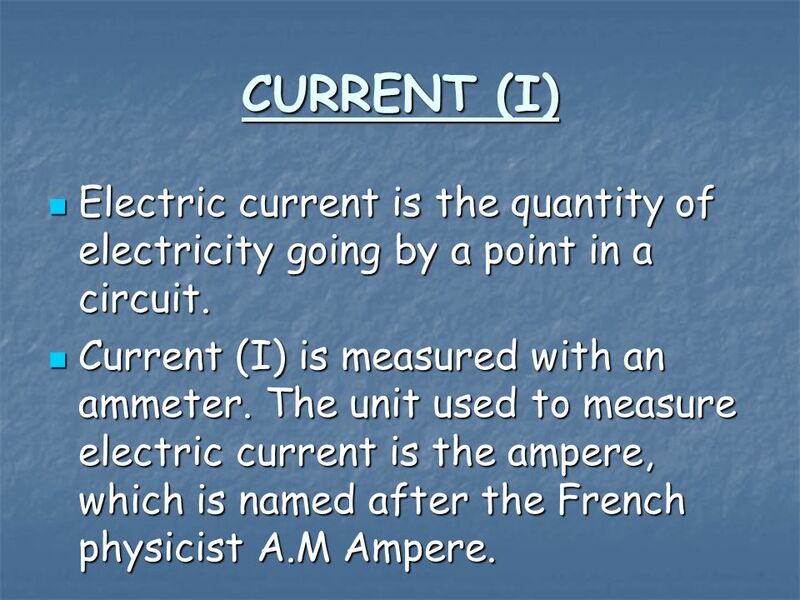 The unit used to measure electric current is the ampere, which is named after the French physicist A.M Ampere. 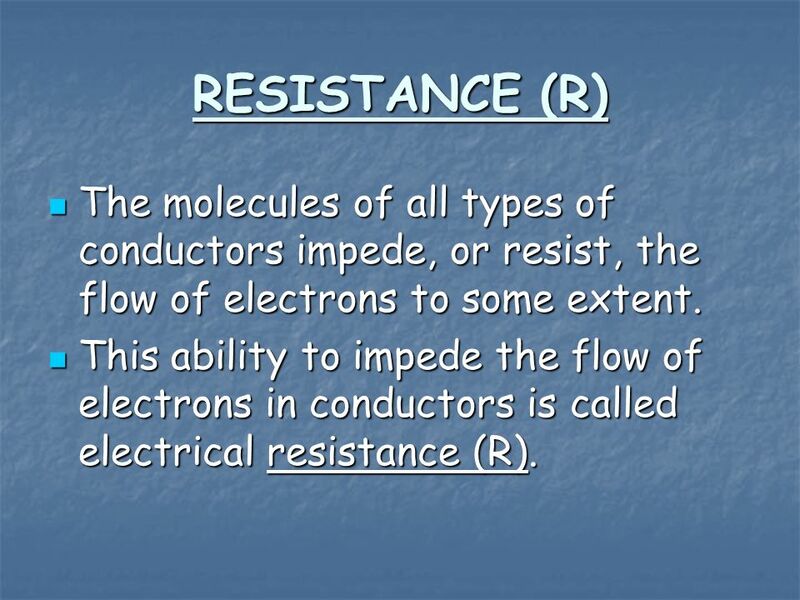 8 RESISTANCE (R) The molecules of all types of conductors impede, or resist, the flow of electrons to some extent. 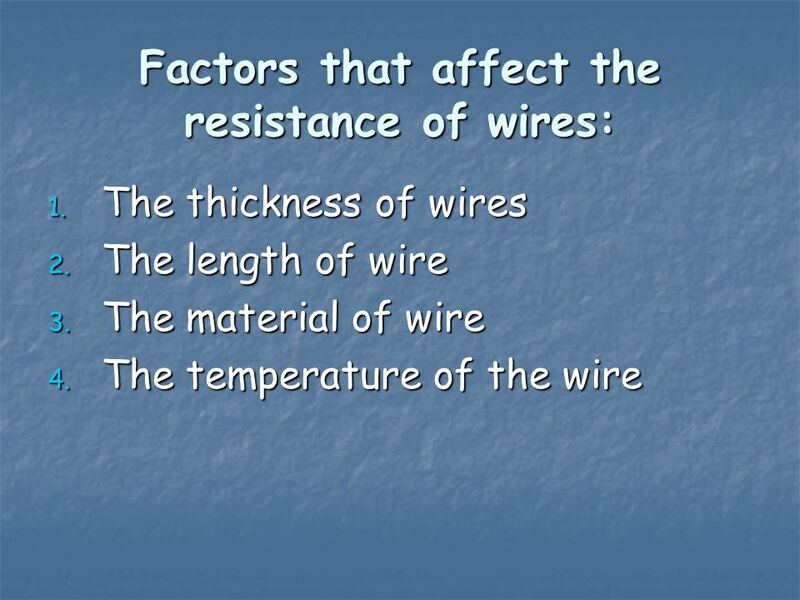 This ability to impede the flow of electrons in conductors is called electrical resistance (R). 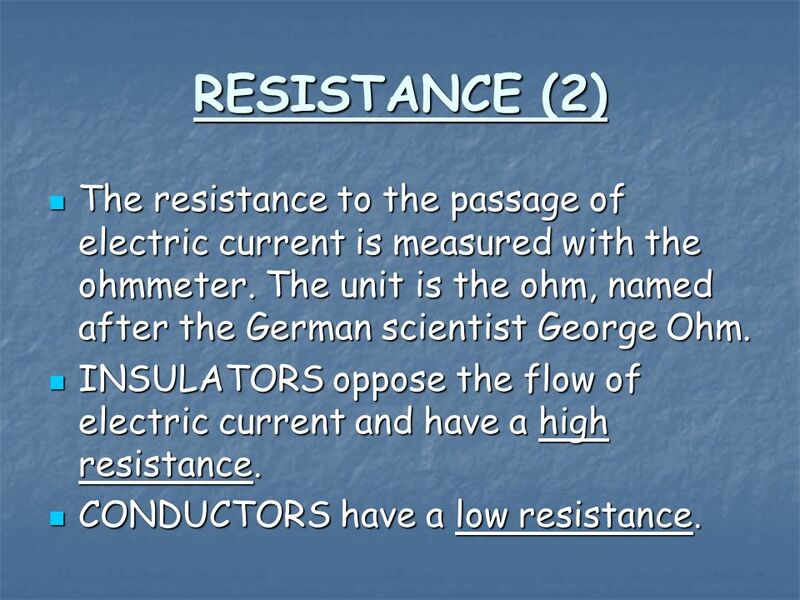 9 RESISTANCE (2) The resistance to the passage of electric current is measured with the ohmmeter. The unit is the ohm, named after the German scientist George Ohm. INSULATORS oppose the flow of electric current and have a high resistance. CONDUCTORS have a low resistance. 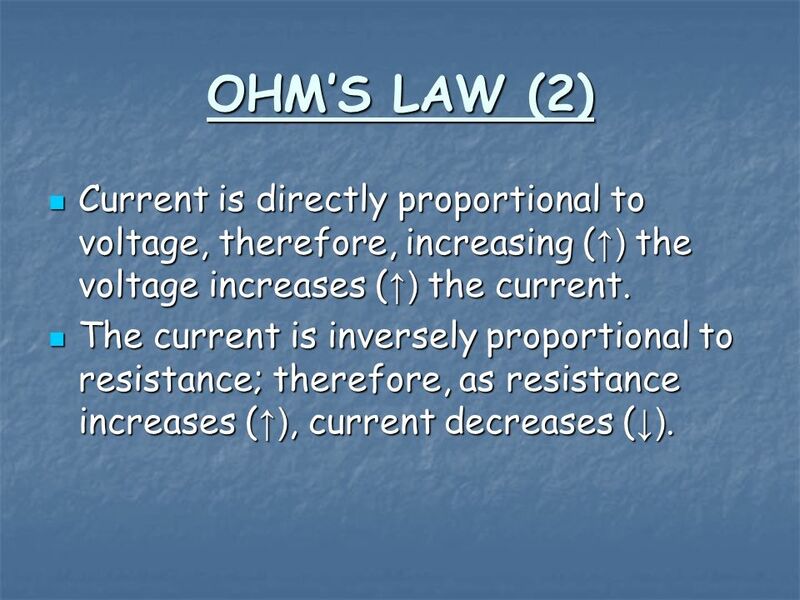 12 OHM’S LAW (2) Current is directly proportional to voltage, therefore, increasing (↑) the voltage increases (↑) the current. The current is inversely proportional to resistance; therefore, as resistance increases (↑), current decreases (↓). 2. If a water heater has a voltage drop of 240V and a resistance of 12.8Ω, what is the current? 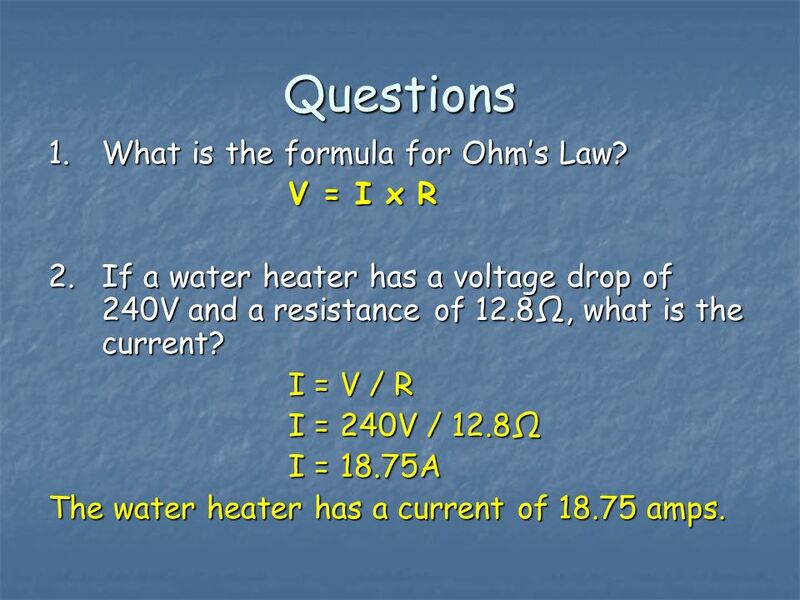 I = V / R I = 240V / 12.8Ω I = 18.75A The water heater has a current of amps. 2. 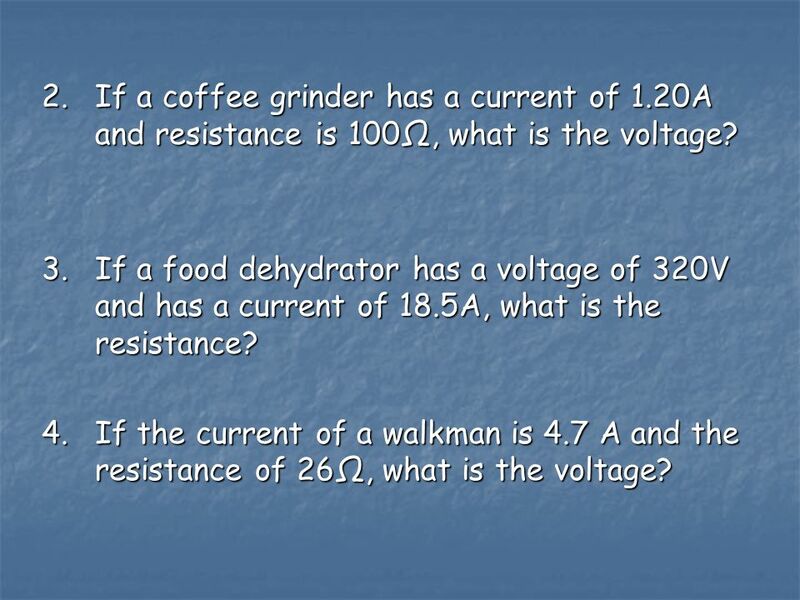 If a coffee grinder has a current of 1.20A and resistance is 100Ω, what is the voltage? 3. If a food dehydrator has a voltage of 320V and has a current of 18.5A, what is the resistance? 4. If the current of a walkman is 4.7 A and the resistance of 26Ω, what is the voltage? 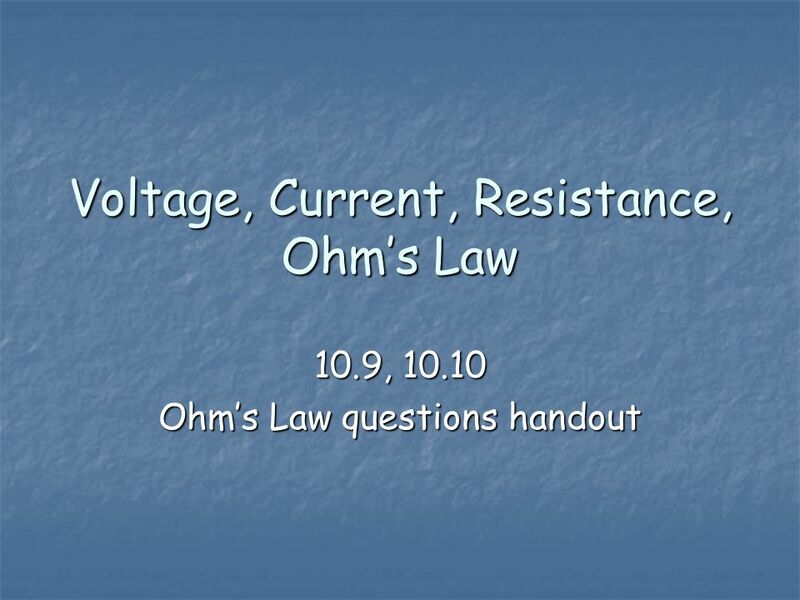 Download ppt "Voltage, Current, Resistance, Ohm’s Law"
Ch Electricity II. Electric Current (p ) Circuit Potential Difference Current Resistance Ohms Law. Nolan R, JT S, and +1 Period 2. What is the unit for Potential Difference? A) amps B) Volt C) Ohm D) Liter. Measuring Electricity. Electrical Current  Day to Day products that we all benefit from that rely on the movement of electrons  Movement of electrons. .  Comparing shocks from static electricity and electric currents is like comparing apples and oranges, they are similar but quite different at the. S1-3-09/10/12 Define electric current, voltage and resistance and solve related problems. KEY WORDS CellCoulombVoltage VoltVoltmeterCurrent AmpereAmmeterResistance. Amps, Volts and Ohms Units of Electrical Measurement. 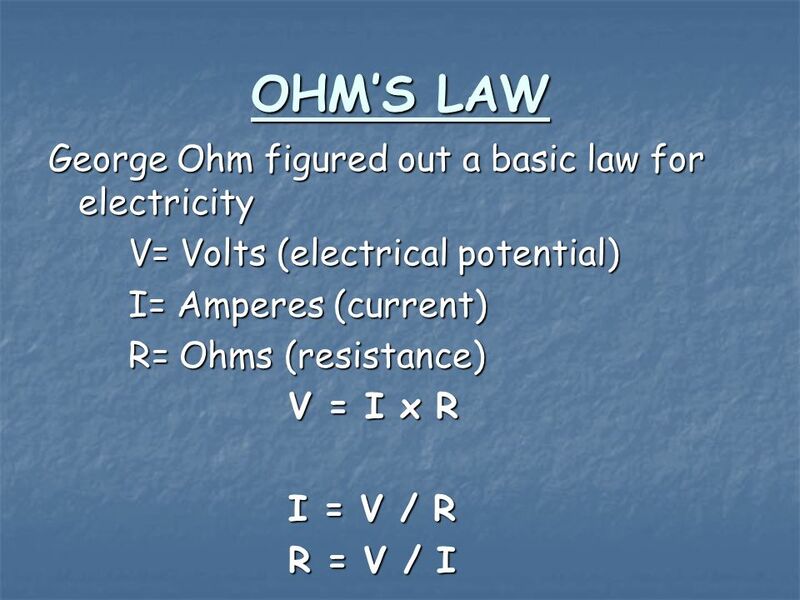 Electrical Resistance and Ohm’s Law. The Electric Current  Electric current is a measure of the rate at which electric charges move past a given point. ELECTRIC CURRENT Electricity, like water, can only flow if charged particles have potential.